This moist spice cake is a white gingerbread, made with sugar and maple syrup rather than molasses. The pear compliments the sweet nutty flavor of Einkorn is easy to make and dresses up nicely for a special holiday meal. Pears: In a small saucepan, combine pears, brown sugar, vanilla, and lemon juice. Cook over medium heat for 15 minutes, stirring occasionally. Mash and let cool for 15 minutes. Add grated ginger and stir to combine. Batter: Preheat oven to 350 degrees. 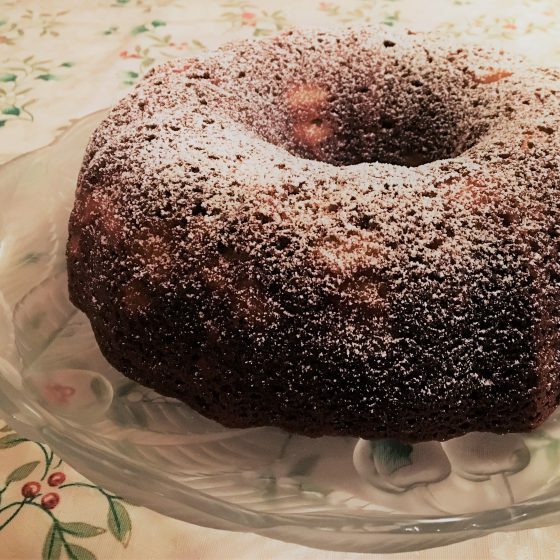 Oil a bundt cake pan, 9×13 Pyrex, or 9″ round or springform pan. In a large bowl, combine the Einkorn flour, sugar, cinnamon and baking soda and stir to combine. Cut in the butter with a pastry cutter or your fingers. In a separate bowl, beat the eggs. Add the buttermilk or yogurt, maple syrup, and cooked pears and mix well. Add the wet ingredients to the flour mixture and stir just to combine. Pour batter into the oiled pan. Bake and Cool: Bake at 350 degrees for 50 minutes, or until a tester inserted into the middle of the cake comes out clean. If using a bundt or springform pan, cool in the pan for 15 minutes, then turn out onto a rack to cool completely. If baked in a pyrex or other pan, place pan on a rack to cool completely. Serve: If desired, pour a bit of powdered sugar into a fine mesh sieve, hold over the cake and tap the sieve to dust the top with as much powdered sugar as you like. Serve as is, or with toasted nuts and freshly whipped cream or crème fraiche.